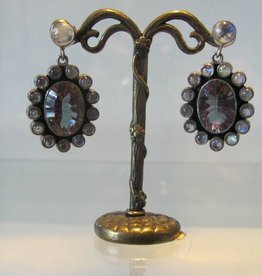 Our silver jewels are hand made in Sitapura Jaipur. The working conditions are excellent. The silver smiths are all mastercraftsmen having learnt their profession from their fathers and grandfathers. This has gone on for generations, and in this way their craft is perfection exlemplified. These days they are also trained in the art acedemy in the use of modern equipment . Other students are also trained in this profession (especially the design aspect to be more appealing to the world market and not just to cater to Indian tastes. All the stones we use are hand cut and polished on the premises by a team of muslim stone cutters this work is traditional, and is handed down from father to son for generation upon generation. These days many stones are coming pre-cut from China which is costing many people their livelyhoods. 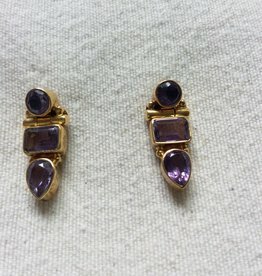 Sometimes it is difficult to obtain certain stones because they are all coming from China and it is extremely difficult to know the working conditions that these are produced in, so we would rather not use them. 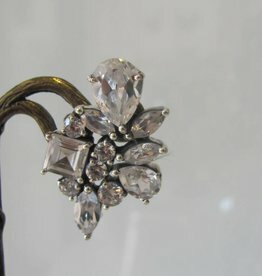 The quality of our silver is 925 sterling. 17cm long. 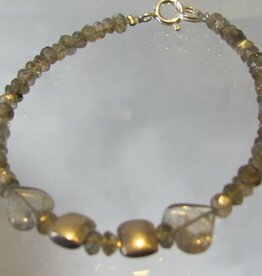 Nice little bracelet form hand made labradorite facetcut beads and handmade silver beads. They are threaded on strong steel cabel and are finnished with a silver closing. Perfection! Simple bracelet, crafted from handmade malachite beads of 4 mm, with a silver closing. Threaded on a steel cable. Length 18 cm. 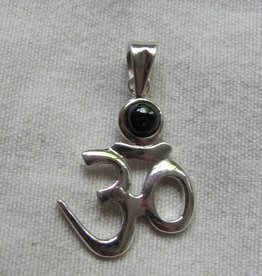 Om pendant with an onyx stone, made of fine silver in Jaipur India by a master silversmith with good working conditions. Fair trade. Om is the first sound of creation. 3cm long excluding the loop. Silver link bracelet, each link is made by hand. Length 19 cm. 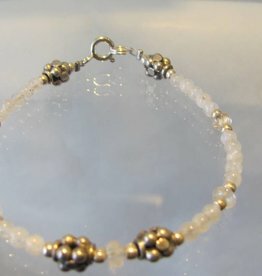 Handmade beads of silver and rainbow moonstones make this bracelet very special. Strung on strong steel cable and finished with a silver closing make it perfect. Length 19 cm. 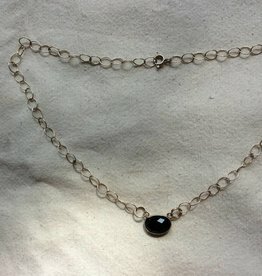 This beautiful silver chain bracelet is completely hand made. 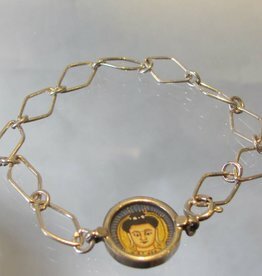 Each link in the chain is hand crafted and the miniature image of Buddha in the medallion is painted with much sensitivity. Length 19 cm.